What do you know how to do — IRL? 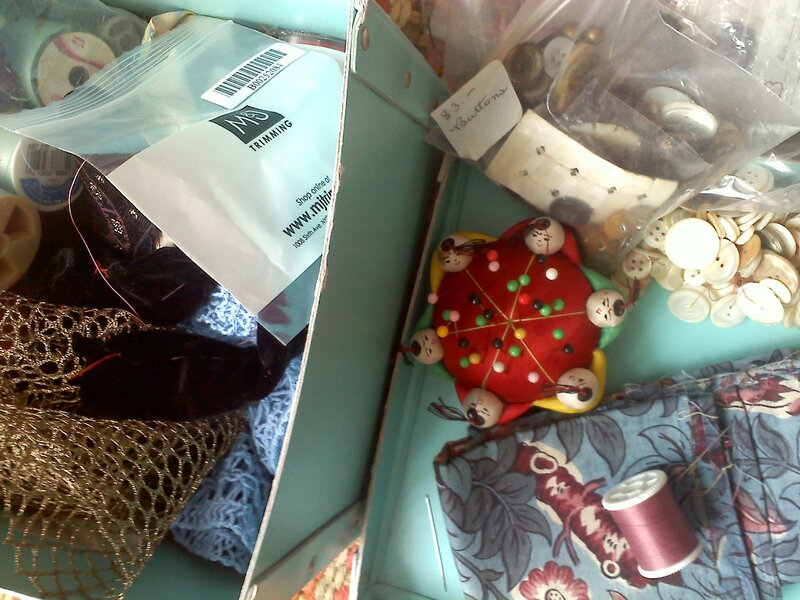 For those of you who don’t have one — and I’m guessing that’s most of you — here’s my current sewing box: needles, thread, ribbon, vintage and new buttons, a bit of vintage cotton, my beloved and very un-PC pincushion of Chinamen (wrong phrase, yes I know) holding hands. My thimble appears to have gone missing, but I rarely used it anyway. I pulled it out the other day to repair a cotton rug whose edging, after only a few washings, had begun to come apart and fray. I think there are people who would have kept it looking crappy and others who might have simply thrown it away. Not me. I also have some mending on my to-do list, old cashmere with a few holes. I love using my hands to make and repair things. Here’s a recent story from The Guardian about a guy who learn how to butcher. 1. I can drive a 5-speed. 2. I can–at least most years–kill a deer with a bow and arrow, gut it, butcher it, and stockpile various cuts of meat for the year. 3. I can build simple furniture like bookshelves and coffee tables. 4. I can make my own beer. 5. I can make a variety of home improvements or repairs, from refinishing hardwood floors to constructing rain barrels. 6. I can make bread from scratch. Being able to do these things is part of my identify and fulfillment; I don’t desire to buy everything I consume, nor do I desire to save time in order to free up more internet browsing or Tweeting. I often challenge my students to disconnect and find a hobby that does not require them to be glued to a screen. Many remain glued to their screens while I tell them this. What are some your handy skills, in real life? I don’t really have any handy skills that don’t involve a computer. I would like to learn how to make my own clothes, however. I’d make such great costumes. I could dress like a character from one of my stories. Interesting text! I too, fix up my frayed carpets, blankets towels; am totally against the throw away/instant gratification society…I also make lots of other things and have become good at using concrete to make all kinds of stuff. Keep up the good work! Mending feels retro, but smart. – Make beautiful things on screen with HTML and CSS. – Ride a horse. I was horse crazy as a kid. Still am to some degree. I think there’s lots to be said for doing stuff on screen. There’s mindlessly trawling the web and actually making stuff on computers. Contrary to popular opinion, it’s not all bad! Sailing is a lot of fun. It’s a great skill to learn. And Spanish is likely a lot easier to learn than Danish! Currying a whole horse Caitlin? Were you feeding the 5000. Lol. I’m guessing you must have taken part in a few shows perhaps? Nothing that fancy. Learned to do it at camp. i can speak spanish and french at a confident kindergarten level, make cards for every occasion, write song lyrics, cook soups, and bake cupcakes. i would love to learn to speak italian and to ride a bike well. Italian is such a gorgeous language. My def. of riding a bike well is not falling off! I’d love to speak better Hebrew, French and Spanish. I’d also love to learn how to surf one day, scuba dive, and play the piano! Trust me, I much prefer AAA!